Who here loves BBQ? I do, I do! Actually, I was kind of indifferent towards it until Jeff and I got together 3 years ago. It's one of his favorite foods, and I learned to love it too. I've tried quite a few varieties, but my favorite by a landslide is the thick and sweet Kansas City-style sauce. I was on a Sweet Baby Ray's kick for awhile, and then I started making the Neely's recipe. It's super delicious, but I wanted something darker with more depth of flavor. I discovered this recipe last week, and with a couple very minor tweaks I knew I had perfection on my hands. If you're wondering what I put this sauce on, you'll have to come back tomorrow! I decided to break up the sauce and meat portions of the recipe so that it wouldn't be too long. In a small bowl, mix together chili powder, pepper, and salt. Set aside. In a large bowl, whisk together ketchup, mustard, vinegar, Worcestershire, lemon juice, steak sauce, molasses, honey, hot sauce, brown sugar, and tamarind paste. In a large saucepan, heat canola oil over medium heat. Add onion, and saute for 5 minutes. Add garlic, and saute for 30 seconds. Add the chili powder mixture, and cook for 2 minutes, stirring constantly. This helps to release their oil-soluble flavors and gives the sauce more depth. Add the wet ingredients, and simmer for 15 minutes with the lid off. The sauce will thicken during this time. Taste the sauce, and adjust seasonings. I ended up adding an extra squirt of both honey and molasses since I like my BBQ sauce sweet. If you don't want chunks of onion and garlic in your sauce, pass the sauce through a mesh strainer. I just left them in since I liked the texture it added. *This is optional, since it may be difficult for you to find. I located it either in the Thai or Indian section at Whole Foods (I forget which since I spent about 20 minutes in the aisle trying to find it! ), and the jar looks like this. Oh this looks yummy! I love BBQ sauce on everything. I love this type of BBQ sauce. More what I grew up with. NC has several different types to and everyone here has a favorite! Thanks for sharing this one. That's what I'm here for :) This is definitely my fave type! Im always looking for new BBQ sauce recipes. This one sounds wonderful. I love that there is tamarind paste in it! I'm really glad I was able to find it - I'm going to have to figure out something else to use it in! I want to smear this on anything and everything. I especially love the tamarind in it. This is my favorite style of bbq sauce too. The ingredient list looks like it would make the perfect sauce! Love the dark color too. This looks fantastic. I've been looking for a good BBQ sauce recipe for ages, this this might be the one.. Sounds excellent! Can't wait to give it a try! I live in San Antonio, and find it interesting that you refer to a 'Texas Style' as thin based on some place in Washington DC. I grew up on thick, sweet sauce, with a kick like a mule that my mama made from scratch, similar to what you have here. You get pretty close to what I have loved for oh so many years. Its a pretty darn good sauce! Haha. Yeah, that was probably a faux pas on my part, although in my defense, I know quite a few Texans who agree that the mentioned DC place is some good BBQ :) I used to travel to San Antonio about once a month for work, and sadly never tried BBQ there! (although I ate some damn good Tex-Mex) I'm curious if there are different BBQ styles even throughout TX? What is the refrigerater life of this? And about how big was the container you put it in (how much does it make)? Hi Nichole! It makes about 6 cups. I'm not sure what the refrigerator life would be...since it contains onions (which presumably will go bad quickly since they're fresh) I would probably want to use it within a week. The website that I adapted the recipe from says a month, but that seems a bit risky to me. How much does this recipe make? I'm thinking about making this and giving it as gifts. GREAT sauce!! I kicked it up a little with a teaspoon of cayenne and it turned out great.I really like the way it hangs on to chicken on the grill.Can't wait to try it on my ribs. 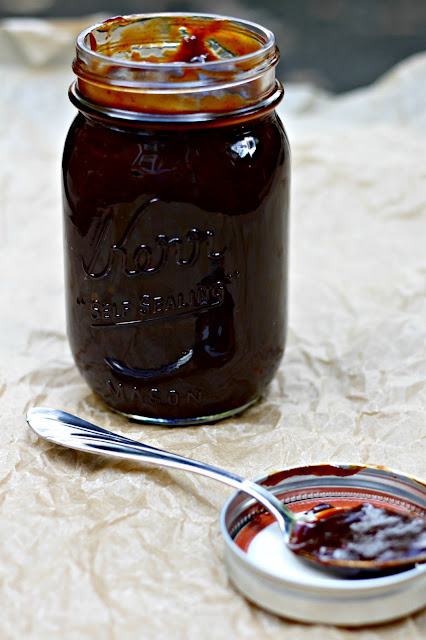 Thanks for posting this, I share your recipe with anyone who mentions wanting to try a homemade BBQ sauce. I think I have made this sauce about 10 times already and I will never go back to store-bought! I love it and I get so many compliments for it! I don't add the steak sauce and I add some liquid smoke to get that smokey flavor! Love it! Thanks for the recipe! Keep em coming!